The cast of the Theatre Under the Stars production of The Drowsy Chaperone. Photo by Tim Matheson. The kids can have their Mary Poppins. For the more mature audiences, Vancouver’s Theatre Under the Stars (TUTS) is giving us adult fare with The Drowsy Chaperone this summer. Not that TUTS hasn’t presented more serious works over the years, but this season’s second show under the stars at Stanley Park’s Malkin Bowl is somewhat of a departure. And even while nothing in The Drowsy Chaperone will offend, there is something a little more grown-up about this comedy-within-a-musical. 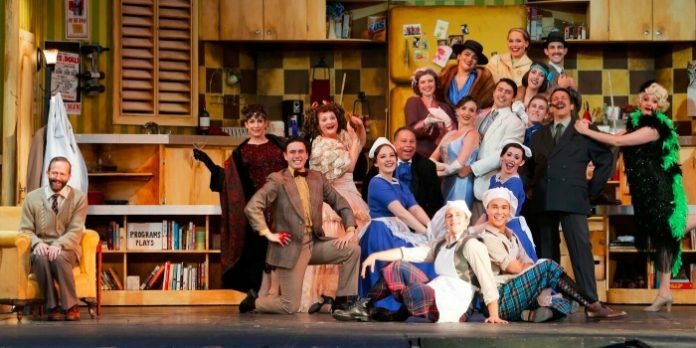 Don’t confuse grown-up with sophisticated though, as while The Drowsy Chaperone has moments of wonderful poignancy, due to Shawn Macdonald’s star turn, it is also filled to the brim with silly fun. This, ironically Canadian, parody of American musical comedies of the 1920s began life at the Toronto Fringe Festival in 1999. Eventually moving to Broadway in 2006, it took home several Tony Awards, including book and score. Not surprising, given how clever and successful writers Bob Martin and Don McKellar were in finding the balance between the ridiculousness and the melancholy. Two-shows-in-one, The Drowsy Chaperone tells the story of a slightly depressed and anti-social musical theatre fan who finds comfort in his Broadway cast recordings. Known simply as “Man in Chair”, he addresses the audience, despite having just told us how much he hates it when shows break the fourth wall, eager to share one of his favourites. In this case it is the fictional 1928 Broadway hit, The Drowsy Chaperone. Settling into his armchair to listen, the musical quite literally bursts to life in his apartment. The musical itself concerns the wedding of Broadway star Janet Van De Graaf to the handsome Robert Martin. With Van De Graaf declaring she is willing to give up stardom for love, Broadway producer Feldzieg tries to derail the wedding to save his Follies in which she stars. Add a couple of gangsters looking to ensure their boss’ investment in Feldzieg’s show is protected, a surprise visit by an aviatrix, and the requisite ditzy chorine, the meta madcap is near endless. As the over-the-top musical plays out around him, Man in Chair regales us with some wry observations on the music, story, and actors. 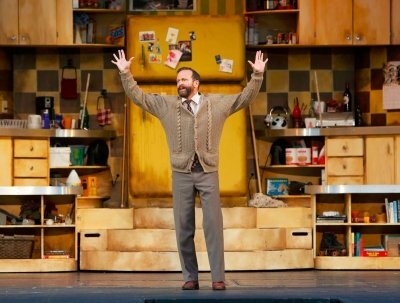 It is within these often-funny and biting comments where The Drowsy Chaperone shines, thanks to Shawn Macdonald’s terrifically sardonic performance. But while there is a risk the sarcasm will wear thin, there is an aura of pure joy in Macdonald’s performance as he listens (and watches) the musical play out. Shawn Macdonald as Man In Chair. Photo by Tim Matheson. While not mentioned in the show’s program, this is not Macdonald’s first time with The Drowsy Chaperone. He last appeared in the show alongside David Marr as gangsters in a 2008 production for the now shuttered Vancouver Playhouse. Almost ten years later, Macdonald takes the lead in what surely must be on many musical theatre performer’s bucket lists. Taking over the roles of gangsters disguised as bakery chefs in this production, Kai Bradbury and Nicholas Bradbury are both fearless and funny. Combining their ample skills with the roles’ physical comedy demands, they are just as skilled in the music department. The two, who are not related, perform much of act two in blue leotards and tutus, with not a single whiff of self-consciousness as they embrace the absurdity of their characters. The two Bradbury’s are joined in their commitment to the silliness by this entire cast. Under Gillian Barber’s direction, there are no small performances in the musical playing out in the apartment, allowing Man in Chair’s combination of clever observations and sometimes touching pathos to ring through with clarity. Other stand-outs in this terrific cast include Dimitrios Stephanoy as the Lothario Aldolpho who, despite the acknowledged ethnic and racial stereotypes, goes for broke and comes up with a delightfully funny performance. In more meta-theatrical performances, Sheryl Anne Wheaton and Peter Stainton play an aging vaudeville duo portraying hostess Mrs Tottendale and her manservant, known simply as “Underling”, inside the musical. While vaudeville can be an acquired taste, especially for modern audiences, their spit-take scene is hilarious. Their performances are sure to remind many of the classic Carol Burnett Show skits. Perhaps surprisingly, for the uninitiated at least, this musical’s title comes via one of the musical’s characters. Referring to the chaperone of the bride, the descriptor comes early as she declares champagne makes her drowsy. Played by Caitriona Murphy, one of only three professional actors on stage, she embraces her character with as much gusto as the martini glass which becomes an extension of her arm. 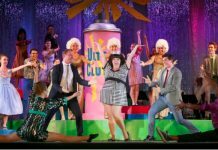 In one particularly funny moment, she even gets help from musical director Kevin Michael Cripps, ensuring she never goes dry. With one of the best voices of the night, Ali Watson is disappointingly under-utilized in the role of Trix the aviatrix. Lauren Gula nails the ditzy Kitty with hilarious results. As the young bride and groom to be, Shannon Hanbury and Stuart Barkley are perfectly matched, both giving the necessary big performances. Hanbury is particularly good, especially in the showstopper “Show Off”. Director Barber and choreographer Shelley Stewart Hunt work well together on Brian Ball’s massive set. Using every nook and cranny of Man in Chair’s home, including some very clever entrances and exits, it is all non-stop mayhem. Chris Sinosich’s costumes run the gamut of sublime to the ridiculous, in keeping with this musical’s dual personality. And even while the music and lyrics from Lisa Lambert and Greg Morrison are largely forgettable once the curtain comes down, Cripps and his orchestra are top-notch. If you’re looking for a night out with the kids, take them to Mary Poppins. If you’re looking for some adult fun, The Drowsy Chaperone is your ticket. With two solid shows from TUTS this year though, you can’t go wrong with either. The Drowsy Chaperone with book by Bob Martin & Don McKellar. Music and lyrics by Lisa Lambert and Greg Morrison. Directed by Gillian Barber. A Theatre Under the Stars production on stage at Stanley Park’s Malkin Bowl until August 19. Visit http://tuts.ca for tickets and information.